For the larger variation, which is sold in Europe as the "Land Cruiser V8", see Toyota Land Cruiser. The Toyota Land Cruiser Prado is a full-size four-wheel drive vehicle in the Toyota Land Cruiser range. It is produced by the Japanese car maker, Toyota. The Prado is one of the smaller vehicles in the range. From 2009, the Prado is based on Toyota's J150 platform. The Prado may also be referred to as Land Cruiser LC70, LC90, LC120, and LC150 depending on the platform. In some markets it is known simply as the Toyota Prado. In North America, the Prado is not part of the Land Cruiser range; the rebadged Lexus GX occupies the Prado's position in luxury trim. The GX uses practically identical body panels and V8 engine. Prado has ladder frame chassis, two-speed transfer boxes and rear beam axles. The J70 platform has a front beam axle while the J90, J120, and J150 platforms have front independent suspension. As of 2014, the Prado is available in every Toyota market, except the US, Canada (both available as the Lexus GX), Mexico, Brazil and South Korea. First developed as the light-duty vehicle of the 70 Series, in November 1984. Available only in short body with options for soft top or hard top (metal top). Names like Land Cruiser II, Land Cruiser, and Bundera were made for these "light duty" Land Cruisers. The Bundera was a short wheelbase—being 2,310 millimetres (90.9 in)—with two-doors, a plastic top, and barn doors at the rear. There were three options for the engine, the 2.4 L (2366 cc) 22R petrol engine and 2.4 L (2446 cc) 2L and 2L-T diesel and turbocharged diesel engines. Transmission for the petrol engine is the G52 type while the diesels used the R150 and R151 types. These were the same engines and transmission used in 4Runner, in cooperation with Hino. In April 1990, a new type, the Prado, was introduced, with a redesigned front grille, front fenders, engine hood, and head lamps. At the same time, names like Land Cruiser and Land Cruiser II were still used in other parts of the world besides Japan. Prado means meadow or field in Portuguese. Despite a body-on-frame design making it highly capable off-road, the vehicle was marketed toward on-road use. In Japan it came with electronic fuel injection and four speed automatic transmission. The 2.4 L turbocharged diesel engine with 71 kW (97 PS; 95 hp) and 240 N⋅m (180 lb⋅ft) high torque unit was installed. The line up included 2-door and 4-door versions available in SX, LX or EX (4 door only) grades of trim. x and soot. The dash board was replaced with a new design with minor changes to suspension, brakes, and trim details. In May 1996, the J70 series underwent a makeover and emerged as the J90 series Prado, an independent series. The body was lengthened. The design remained medium duty, like the J70. The front suspension was replaced with an independent design, shared with Tacoma and Hilux Surf, made by Hino. The J90 was made by Tahara Plant, available as a three-door short wheelbase and five-door long wheelbase version. In Japan, the 3-door series started with an R in the series ranging from RZ, RX, RS to RJ while the 5-door line-up started with T in the series ranging from TZ, TX, TS, to TJ. All models came with front double wishbone and 4 linked suspension as well as full-time 4WD. ABS and a Field Monitor showing altimeter, thermometer and pressure were standard in all the models. The field monitor was not available as standard equipment in South Africa. Television display and audio set was optional. Petrol engines included the 2.7 L (2693 cc) 3RZ-FE and, new in Prado models, the 3.4 L (3378 cc) V6 5VZ-FE. Diesel engines were the 2.8 L (2776 cc) 3L engine, the 3.0 L (2986 cc) 5L engine and the 3.0 L (2982 cc) 1KZ-TE. There was also a luxury version of the J90, called the Challenger. Features of the Challenger are standard leather seats and wood on the dash. By June 1999, minor changes were made. In order to follow new laws, fog-lamps were added to the bumper, except in South Africa. To reduce theft, an engine immobilizer was available. TX Limited with 8 seats used TX base with roof rail, rear under mirror, wood panel finish, armrest, optitron meter, base cooling as well as rear heater was introduced into this series. The Prado was assembled by Sofasa in Colombia from 1999 until 2009 without significant changes. There were two versions, a 3-door with a 2.7 L engine and 5-door with a 3.4 L V6 engine with either a 5-speed manual or a 4-speed automatic. Between 2005 and 2009 they offered an optional armoured version of the 5-door version. 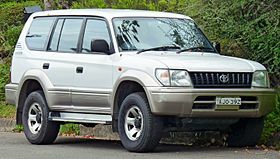 When the Prado was launched in the UK in 1996, it was called the Land Cruiser Colorado and replaced the 4Runner, which had been discontinued from sale. It was called this to distinguish it from the larger Land Cruiser – renamed as the Land Cruiser Amazon – which was already on sale. It dropped the Colorado name tag in 2003, when it was renamed simply Land Cruiser. In the Republic of Ireland most Land Cruisers were sold as commercials with the side windows and seats removed for tax reasons. Appearing in 2002, the third generation Prado has revised front suspension to improve reliability. Development began in 1997 and design work in 1998, with the winning proposal originating from Lance Scott of the Toyota ED2 design studio in France in late 1999. Engines include the 2.7 L (2693 cc) straight-4 3RZ-FE, 3.4 L (3378 cc) V-6 5VZ-FE and 3.0 L (2982 cc) straight-4 turbocharged diesel 1KZ-TE. In countries like China, a newly developed engine 1GR-FE V6 is available. The engine immobilizer became standard equipment in some markets. In August 2004, the 3RZ-FE engine was replaced by 2.7 L (2694 cc) 2TR-FE engine and in July of the same year, the 5VZ-FE engine was replaced by 4.0 L (3955 cc) V6 1GR-FE engine with 5-speed automatic transmission available in late 2005. In North America, this model is known as the Lexus GX 470 with the 4.7 L (4663 cc) V8 2UZ-FE engine. Diesel models have had the 1KZ-TE turbocharged diesel engine with maximum output rating 96 kW (131 PS; 129 hp) as well as the 5L-E natural aspirated diesel engine rating 70 kW (95 PS; 94 hp). In November 2006, Toyota introduced the 1KD-FTV turbocharged diesel (D-4D engine to meet Euro IV emission standards. This engine delivers 127 kW (173 PS; 170 hp) of power and 410 N⋅m (300 lb⋅ft) of torque. The upgrade to the D-4D engine was also matched with transmission upgrades to the diesel range, with the 5-speed automatic and 6-speed manual transmissions added in line with the petrol powered range. From August 2007 the Prado received several equipment and safety upgrades. The car has won 3 awards for the best performance on a SUV type vehicle in Australia and US. The 120-series Land Cruiser Prado shares the same suspension parts as the Hilux Surf/4Runner and FJ Cruiser for similar years. There is a shorter three door version of the 120-series, with a 125-code instead of 120. Engines are the same, most features are the same; just the 1KZ-TE was only available in five door version. The three door wagon features only two seat rows. The fuel tank is limited to 87 L, no sub-fuel-tank system available. The Japanese Prado consisted of 6 trim levels known as Gx, Tx, Tz, Tx Limited, Tzg and Tz limited. The highest specification model known as Tz limited consisted of features like front driver and passenger heated seats, heated exterior mirrors, adjustable air suspension, hill start assist control downhill assist control, central differential lock and sometimes engine auto heating. In China, Dadi Auto made two clones of the SUV called the Dadi City Steed and the Dadi Shuttle. Both models have been produced since 2006 and 2007 respectively. The fourth generation has been available in some markets since October 2009. There are two base variants, five-door and three-door. The five door variant in the general market is offered in TXL & VXL grades – which are much more option packed. This generation of Prado features advanced 4WD and an array of electronic gadgets. This generation of the Prado is offered in the US badged as the 2010 model year Lexus GX 460 with luxury trim. Depending on the market, the fourth generation is available with an under-floor mounted or rear door mounted spare wheel. For example, UK vehicles have the spare wheel mounted under the floor, while in Australia and Argentina the spare wheel is mounted on the rear door, leaving space for an auxiliary fuel tank, which is desirable in countries where long journeys in isolated areas may be required. The fuel capacity of the dual tank series four is 150 L compared to 179 L of the series three. The removable third row three-seaters of the J120 were replaced by fold-into-floor seats which seat only two people – which is also responsible for a loss of cargo capacity, the reduction in dual fuel capacity and usable height in the cargo compartment. On the higher end VX and Kakadu models, there are six camera positions enabling viewing to the front and down, to the side both front and rear, and to the rear. The engine remained the same, although the automatic gear change points were altered for maximum fuel economy rather than maximum performance, even in Sports mode. In June 2015, Toyota improved the petrol engine with dual VVT-i, increasing the power output by 5 kW to 207 kW (281 PS; 278 hp) and the torque to 381 N⋅m (281 lb⋅ft). The diesel engine was replaced with the smaller 1GD-FTV. Both engines were upgraded to the 6-speed Aisin AC60F automatic transmission. The second facelift was launched in Japan, Europe and Australasia on 12 September 2017. 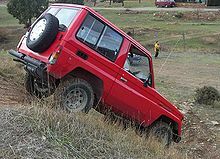 The fourth generation Prado was released in Australia on 16 November 2009. Five-door models include the GX, GXL, VX, and the high-end Kakadu. The Altitude model, introduced in 2012, is priced between the GXL and VX, and has satellite navigation, two-way moon roof, leather accented trim, and 7" Fujitsu-Ten touch-screen/multimedia center. Three-door shorter wheelbase models include the SX and ZR. In late 2013, Toyota dropped the three-door Prado variants due to poor sales. 2013 also saw a refresh, with more standard equipment, new front panels, and new headlights. Higher specification models received LED headlights and suspension improvements. Unlike in Japan, Toyota Australia retained the 4.0L V6 power unit (Model: GRL150R). All GXL models received a seven-inch sat-nav as standard. In Europe, the J150 Prado is designated Land Cruiser LC3, LC4, and LC5, depending on the equipment levels. In some markets, commercial van variants, based on the short-wheelbase chassis are available. In Japan, the 1GR-FE engine was available from 2009 until June 2015. The monthly sales target for Japan is 1,000 units. The 4.0-liter 1GR-FE V6 was standard paired to a five-speed automatic gearbox. On 24 September 2015, the fourth generation mid-life facelift received a new 3.5-liter V6, the 7GR-FKS to replace the previous 4.0-liter V6. While the engine capacity is lower when compared to the 4.0-liter, the power output remains the same at 206 kW (280 PS; 276 hp) and 365 N⋅m (269 lb⋅ft) of torque. 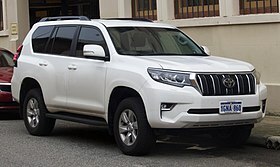 It uses less fuel and it is known to be the only country in the world to offer the Prado with 3.5-liter V6 (model GRJ152L) to the consumer alongside with the 2.7-liter inline-four petrol (model TRJ152L). Meanwhile, the 2.7-liter engine version (model TRJ152L), introduced in October 2013, got a revised 2TR-FE engine with dual VVT-i, and the four-speed automatic was replaced with the previous six-speed AC60F; the 3.5-liter V6 version also got the new transmission. ^ "Portuguese translation of 'meadow'". Collins Dictionary. 2014. Retrieved 2018-10-31. ^ "Toyota Merú" (in Spanish). Toyota Venezuela. Archived from the original on 2012-07-24. ^ a b "75 Years of Toyota | Vehicle Lineage | Land Cruiser Prado (90)". Toyota. 2012. Retrieved 2018-11-30. ^ "New Prado packs punch". WebWombat. 2003. Retrieved 2016-02-09. ^ "Land Cruiser Prado Now Assembled in Russia". Wroom.ru. 2013-02-18. Archived from the original on 2013-05-10. Retrieved 2013-02-21. ^ "Prado – Specifications". Ghana: Toyota. Retrieved 2017-04-30. ^ "Toyota Reintroduces Hilux into Japanese Market after 13-year Hiatus, Land Cruiser Prado undergoes partial redesign and FJ Cruiser launches with special specifications". Toyota Global Newsroom (Press release). Japan. 2017-09-12. Retrieved 2017-11-25. ^ "2012 Toyota LandCruiser Prado Altitude launched". CarAdvice.com.au. ^ "Toyota Prado: Specification Summary (Australia)". 2009. Retrieved 2009-11-16. ^ "Toyota Sharpens Best-Selling Prado Range" (Press release). Australia: Toyota. 2013-10-14. Archived from the original on 2016-03-06. Retrieved 2014-03-17. ^ "Land Cruiser specs (Japan)" (in Japanese). Retrieved 2015-09-15. ^ "2010 Toyota Land Cruiser Prado Review". Taume News. 2009-10-15. Archived from the original on 2009-10-03. Retrieved 2009-11-24. ^ "PRADO 普拉多" [PRADO Prado] (in Chinese). China: FAW Toyota. Retrieved 2017-11-25.